I have a lot of fetishes when it comes to cars: among them, I love small, weird, unusual engine placements, utility vehicles, interesting turn indicators, and extremely good space utilization. The Cony Guppy may be one of the only cars that ticks off every box in my fussy little list. It’s a small, weird, mid-engined pickup. One moment, I need to control my breathing. As if all this wasn’t enough, the Cony Guppy also has a roadster variant, which I’m pretty sure is the only roadster/convertible/sportscar that’s based off a pickup truck. I mean, I’m likely wrong, and I’m sure some commenter who’s even geekier than me will know, but there can’t be too many sports cars that were derived from pickups, right? Of course not. The company that produced the Cony, Aichi Machine Industry Company (still around, and now part of Nissan) was started right after WWII, and the Cony line was started in 1961 as a cheap utility vehicle that fit within the nascent Kei car class. The Cony’s design I think may be one of the first absolutely unique Japanese car designs — most cars built prior to the Guppy were either license-built Western cars (like, say, the Hino version of Renault’s 4CV) or at least substantially derived from them. Sure, there were plenty of interesting innovations and design ideas, but as far as a totally new, unseen-anywhere-else design, Cony’s mid-engined tiny pickup with a trunk was a Japanese original. It’s a fundamental design I’m so taken by I realize now that I unconsciously scaled it up and cribbed it when I drew up my twin-bed truck idea. As per my personal truck ideals go, the Cony Guppy is just about perfect — almost all the length of the truck is usable: some storage up front, then a passenger compartment, then a bed. The engine is tucked under the bed, right behind the cabin. It’s an early part of a space-utilization legacy that the Japanese manage to do better than anyone else. I haven’t been able to find an image of how things are laid out under the Guppy’s front hood, but I think there is some manner of trunk there — even with fuel tank and spare tire and brake cylinders, I bet there’s at least a Fiat 126’s trunk worth of space up there. 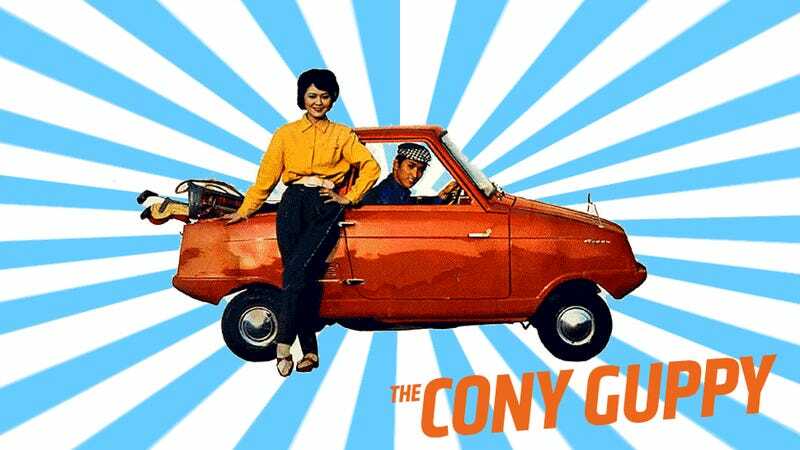 The Cony Guppy (‘cony’ is an archaic term for ‘rabbit,’ so the car is named, basically, Rabbit Fish) was a very cheap, minimal vehicle, designed to be affordable to almost anyone. As such, its specs are pretty meager: a 1 cylinder 199cc two-stroke engine making all of 11 HP. It could hold about 220lbs in the load bed and got about 70 MPG. It even had a torque converter, so you needed no clutch! That’s really unexpected on a vehicle like this, and is one of the rare cases where an automatic (-ish) transmission actually makes the car cooler. Even the styling of the Guppy is pretty clean and appealing, I think. It has a sort of crisp, almost-Michelotti sort of look to it (it reminds me of Michelotti’s take on the Fiat Jolly), and has many details I’m a sucker for, like wing mirrors, suicide doors, and those hilariously huge indicators that look like miniature orange cupcakes stuck to the B-pillar. In the (possibly one-off? I’m not certain) roadster variant, I even like the attempt made to blend the seatbacks into the bodywork, like a Porsche Spyder. The Guppy is so appealing to me because it’s a shrunken template of a vehicle I’d love to own. If you could scale this mid-engined pickup truck up to about the size of, say, an old Ford Courier or so, give it about 15x the horsepower, then I think I’d be ready to dig up a copy of that meme where Fry implores someone to take his money, and shut up. Another interesting detail is that I’ve seen pictures of Guppies that are badged in Japanese, like in that ad above. This is actually pretty unusual for a Japanese car, which usually uses western characters for its name and badging. The Guppy was produced only for about one year, so they’re pretty damn rare, even in Japan. But now you know about these as well, and maybe some of you can help me start a campaign to make the 2018 Juke a modernized, up-scaled Cony Guppy.